Traveling in an RV is the perfect anecdote to complacency and taking niceties like running water and electricity for granted. I’m writing this post on March 26th. We left Florida a few days ago, and we’re feeling some mixed emotions. Our house batteries have been on the fritz, at least in part, for more than a year. We started having issues over a year ago when we first arrived in Florida. When we visited our mechanic, they said we could milk them for another year. It turns out that might have been optimistic. Even if you don’t use the electricity for anything else, a little bit is required to run your fridge on propane, so when the batteries are dead, you lose your fridge. Unfortunately we’ve been testing that. We get the fridge back for a bit when we drive, but it doesn’t let very long when we stop. So while we could purchase coolers, we’ve decided to deal with it, at least as long as we can. So we bought a Passport America membership and our goal is to plug in every other night to keep the fridge and our food happy. We’ll be in New Mexico by the end of the week, and their state parks are supposed to be awesome and easy to walk into, so fingers crossed that by Friday or so, we will be plugged in. We will then commute to our gigs (in Silver City and Alamogordo) from there. We’ve also been having issues filling our RV tires. We purchased sensors to make it easier, but they’re very finicky. But it turns out Walmart is really nice about helping us to check and fill tire pressure – so far for free. What a blessing! We’ve enjoyed our travels so far. The weather has been beautiful and we’ve seen tons of lakes/rivers/the Gulf so it’s been lovely. 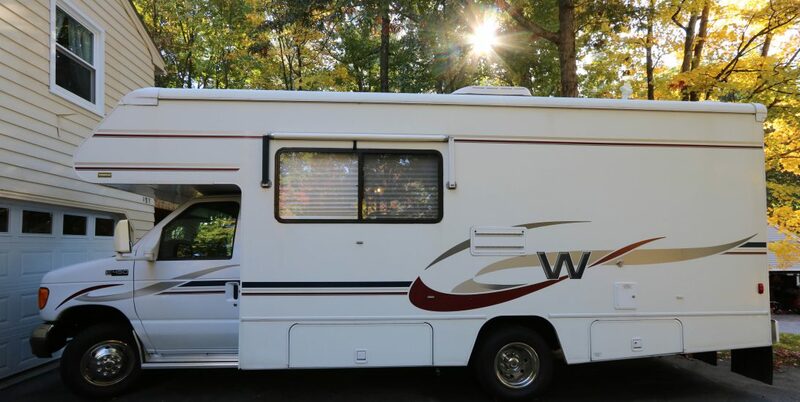 We also stayed at two wonderful campgrounds we’d be happy to return to or even workamp (especially the first): Pine Lake RV Park in western FL and Martin Lake Resort outside Biloxi, MS. Both have somewhat usable internet, gorgeous water features and places to walk, and the latter has a jacuzzi and gorgeous pool and a swim beach/place to fish and kayak (and lots of kids and teens). The former is quiet and secluded and has a workout gym and a piano in their rec room. Luxuries! We’ve got a bit of work to do this morning before continuing on. Hopefully by the time you read this, we will be settled or almost there. Safe journey wherever you are! We recently found ourselves in Crystal River, home of the manatees, and it’s a sweet town that makes for a great outing. We barely dipped our toes in here, but here are some ideas for your next trip! It’s adorable, and there’s a free museum in the old City Hall to explore. You can even see where the old jail cell used to be in the back! I was especially excited to see the diverse residents who’d found success in Crystal River. It’s always nice to learn about successful people of color, particularly in areas with less diversity today. You can pay to park at one of the city parks or at the local state park, and they’re easy to find with the signage. There are many ways to visit manatees, and they generally involve a boat rental or tour. We actually stopped at a local ice cream place (priorities) and they had a gorgeous area to sit outside by the water. So we did that for a while, and then we grabbed a seat on a bench and watched the birdlife and sealife for a while. It was awesome. There are tons of local shops to browse (it reminded us of Maine, if Maine had palm trees and the like) and many cafes were calling out to us. The one that we wandered into had great coffee, friendly people, and amazing-looking pastries. #4 Visit the Local Mall? Okay, so maybe this isn’t exciting…but we ended up at a local mall that included a chain called Rural King, a movie theater and some local businesses, including a great music store where we found a reasonably priced speaker for our arsenal. Of course you should check out the local seafood while you’re here, and visiting the Gulf is a good idea. We look forward to visiting again in the future! Well, it’s almost arrived. Time to pack up and finish our to-do list before we hit the road. We will be moving at a quick pace, taking a week or so to get to New Mexico, but we’re hoping to take it easy once we get there, exploring and playing a few gigs. I’ve heard that the State Parks in New Mexico are beautiful and easy to get a space in, so we will be putting that rumor to the test too. Florida has been great to us. From Disney to visits with friends and family and from our comfy campsite to our new cat, Squeak, life has been fun and full of adventures. We’ll keep reporting in with new updates along the way. For the latest, you can follow us on social media, including our Facebook page. I hope you all enjoy your weekend! Ours will be full of hard work and preparation. Happy Friday! One of my favorite, free things to do at Walt Disney World (yes, you can go without a park ticket!) is visit some of the beautiful, immersive Disney World resorts. In the past, we’ve fallen in love with Animal Kingdom Lodge (in fact, we spent Christmas there with family), and we’ve decided our other top picks to stay at would be Yacht Club and the Polynesian Resort. One of the reasons we keep going back to Animal Kingdom Lodge is that there’s just so much to do there. Walk into the lobby and it’s almost like a museum, with artifacts from many African countries and beautiful works of art. Walk out back and you’re on the African savannah, viewing wild animals during the day and at night too. At all of the resorts, you can take advantage of free movies and activities (we roasted marshmallows at the Animal Kingdom Lodge on Christmas), and many of the resorts have gorgeous places to read a book or have a meal. This past week, I checked another resort off my list: Wilderness Lodge. I also returned to a favorite, Port Orleans: French Quarter. Both are beautiful places to pass some time – free! – without the busy, more stressed energy of the parks. Wilderness Lodge is designed to feel like a grand lodge in the Northwest United States. The views inside have some parallels to the feel of the Animal Kingdom Lodge, with beautiful displays, intricate artwork and detailing and running water and a bridge in the lobby! Outside you’ll find a waterfall, a geyser that erupts hourly and beautiful theming that makes for wonderful places to have a meal or read a book. I’ve shared some photos to help capture the atmosphere here. There is also a boat from here to the Magic Kingdom, which is a wonderful thing if you have park tickets, but a tease if you don’t! Port Orleans: French Quarter is a wonderful moderate hotel (mid-range pricing and amenities, in Disney-speak) with fun and beautiful decor (it’s Mardi-gras coloring, and music is ever-present) and a food court that serves beignets – including gluten-free ones! You can follow a nice walking path or take a boat from the French Quarter to both Port Orleans: Riverside (a much larger resort in the same tier) or to Disney Springs, Disney’s outdoor mall area. In search of my 10,000 steps for the day, I followed up my visit to Wilderness Lodge with a visit to the French Quarter, a walk to Riverside, a walk back and then some beignets to cap it off. You can probably tell from the photos that French Quarter’s theming is quite different from Riverside and vice versa. They’re both pretty charming, but I prefer the former. It’s easy to spend a day or two of your Disney vacation exploring the resorts. Heck, if you wanted to, you could spend a week without a parks visit! I don’t necessarily recommend that, of course. But there’s great food and gorgeous views and more to be had at some of the fancier resorts, and provided they have space for their guests, you’re welcome to stop by for a visit. If you’re considering a visit to the Outer Banks, either by RV or otherwise, you’ll want to read my guide with the highlights. Everything from the best donuts to the best beaches and historic sites is covered in my blog for Outdoorsy here.